Go Red For Woman in Russia. Activities in 2015. In 2012 Russian Society of Cardiology joined the All-European initiative Go Red For Women aimed at fighting cardiovascular diseases of women. The Red Dress Project of Russian Society of Cardiology is aimed at attracting attention of doctors of various specialities to comprehensive and deep approach to assessment of factors of risk and methods of their correction for women of various age groups, to the matters of primary and secondary prophylaxis of cardiovascular diseases, as well as to coordinated actions on algorithms of diagnostics and treatment of diseases of heart and vessels of women. Red Dress is an international symbol for women, which has the goal to demonstrate both the possible threat for health and the burning desire to unite efforts in order to prevent or conquer the disease. That is why the motto of this Project is Red Dress protects woman’s health. As the results of investigations of the last years showed, women in Europe die of cardiovascular diseases more often than men. As a rule, at the moment of development of cardiovascular diseases women are approximately 10 years older than men, and with the beginning of menopause the risk of development of ischemic heart-disease increases 4 times. With comparable prevalence of ischemic heart-disease among men and women, there are gender specifics of clinical manifestations: women have asymptomatic development of ischemia and myocardial infarction more often. Women with ischemic heart-disease are operated on with regard to myocardial revasculization more seldom than men, they die or get non-fatal myocardial infarction during the first year of follow-up twice as often, regardless of age, degree of disturbance of function of the left ventricle, gravity of affection of coronary arteries and diabetes. Women undergo the EKG test with physical activity more seldom and are referred to conduction of coronary arteriography more seldom. It is also known that men suffer from impaired cardial function in younger age more often than women, but after 75 the situation changes, and the number of women with impaired cardial function, especially with the normal left ventricular ejection fraction, becomes greater. Such women, as a rule, are examined and treated more seldom, regardless of age and important clinical characteristics. Following the general tendency of the life duration increase, it is forecasted that the share of women with impaired cardial function at the elderly age will increase with regard to men of the similar age group. There are gender differences in the clinical presentation of the course of stroke, such as frequency of stroke development, risk of stroke arising during the life, age of onset of the first stroke, degree and frequency of disability after stroke. Women have the first stroke much later than men, and at the age of 85 and up the risk of stroke of women is significantly higher as compared with men of similar age. Besides, it is known that women have higher risk of development of drug concurrent reactions than men. Unlike men, women more often have multiple risk factors of cardiovascular diseases, such as visceral obesity, insulin resistance, glucose tolerance disturbance, hyperglycemia, atherogenic dislipidemia, arterial hypertension. All symptoms are constituents of metabolic syndrome. Even a little increase of weight during the adult period of life is connected with higher risk of death of women, regardless of physical activity. In this connection, during the last years the program on prevention of women’s cardiovascular diseases is being actively developed all over the world. In 2010 European Society of Cardiology jointly with European Heart Network and World Heart Foundation announced the Women at Heart Contest, within which it was proposed to submit socially significant projects on the topic of increase of awareness of population and medics regarding the wide spread of cardiovascular diseases among women. Woman’s Heart Project presented by VNOK and the Project author, Doctor of Medicine V.B.Mychka in March 2011 was recognized as one of the most innovative projects and awarded the silver prize. The new initiative of European Society of Cardiology - Go Red for Women and the Red Dress Project of Russian Society of Cardiology are aimed at development of investigations of gender differences in the area of cardiovascular medicine and increase of awareness of various manifestations of treatment of diseases of men and women at interdisciplinary investigations. Russian Society of Cardiology invites doctors of various specialities interested in increase of professional knowledge in the area of cardiovascular diseases and specifics of their diagnostics, treatment, prophylaxis and approaches of women treatment, to participate in Red Dress Project. 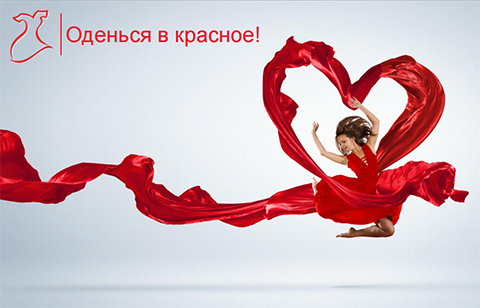 You can find out more detailed information on Red Dress Project in Russia and join it on the website of Russian Society of Cardiology: www.scardio.ru.